Who do they like to live with and eat? Mammuthus primigenius is more commonly known as the Wooly Mammoth. This Ice Age mammal is similar to a mastodon, but with larger tusks and a sloping back. Even at nine feet tall, it is small for a mammoth. Mammuthus primigenius has a trunk that is somewhat shorter that that of its cousin the elephant. The trunk ends in two fingers, which the Wooly Mammoth uses to bring food to its mouth. The tusks are larger than those of either an elephant or a mastodon and can be used to clear the snow off of its food. These tusks are curved and extend almost down to the ground to reach low-lying bushes. 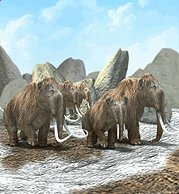 The Wooly Mammoth's ability to find food beneath snow and ice made it possible for it to live on the tundra of Europe, Asia, and North America during the Ice Age. Even during the harsh winters, the Wooly Mammoth could find grass and moss under the snow. Wooly Mammoths can also forage for tree bark and other foods typically found above the snow. Since the Wooly Mammoth prefers to live in colder climates, its coat is made up of a double layer of thick, coarse fur over a three-inch layer of fat. The Wooly Mammoth sheds its fur at the beginning of the summer and regrows it in time for the next winter. An extra hump of fat just behind the animal's skull is built up over the summer and used for nutrition when food is scarce during the winter. Because of their build, Wooly Mammoths are able to travel long distances if necessary. This explains how their geographical range grew so large. Herds of mammoths will migrate with the seasons in search of forage. When forage grows scarce, they rely on their fatty humps to survive. The decline in the numbers of wild wooly mammoths coincides with the rise of humans. Very early humans recorded their mammoth hunts on cave walls. Humans are more clever and effective than the Wooly Mammoths' natural predators, such as the Sabre-tooth Cats. As humans began to hunt them in earnest, the Wooly Mammoth herds began to disappear . Which fence is suitable for this animal in terms of strength, if it can be climbed or jumped over? How big should the exhibit be and what Terrain should be used? What foliage should be used? What rocks should be used? What shelter does the animal need? What toy does the animal like? How deep should the exhibit be if using the "Pit Method"?